That arduino is totally overkill. He really ought to have whipped up a board in eagle, sent it to china to be etched, placed smt parts, done a second board rev and then flashed the chip. Instead he did something clever. Nice hack! I love buying peoples broken laptops from them for $50. Hey all you bus pirateers, could this be done with a BusPirate? Most modern BIOSes including the Eee PC can be recovered from a bad update with a bootable USB drive and the appropriate BIOS file. It’s usually something like Win + B at boot to start it but in the case of Eee PC just having it inserted with the appropriate files works. Is there some reason this procedure could not be done? Very cool, way to save some mondo big bucks! @Pete are you sure? Booting from a USB drive is usually something that you would NEED a bios to be able to do. I guess the Eee PC doesn’t have fail safe bios? Most modern computers have backup bios for when you mess something up or at least a way of re-flashing a bad bios flash. It could also be that because of it’s size and it’s design to be an affordable way of computing, that the price and form factor didn’t allow such a luxury. Great job on recovering someone else’s “junk”! Now this is how I like seeing arduinos being used, a multi-purpose programmable problem solver. @Mikey Yes certain, it’s some sort of additional part of modern BIOSes that is not overwritten during a BIOS flash. I have used it on a bricked phoenix BIOS before but it’s also seems to be on most now in slightly different ways. For mine it was Win + B with USB drive plugged in it then beeps (and flashes if your drive has a light which is handy) leave it a while to be sure switch off, Fixed. You need to be sure your USB drive is setup to be bootable (with HP USB Disk Format Tool or similar) formatted FAT16 and the BIOS ROM is named correctly. Probably best to look for instructions on the internet for each BIOS. If you search for BIOS Recovery you should find details. I confirmed my USB stick by first making it an MS-DOS boot disk and using it on another computer then adding the required ROM. @blue carbuncle There is still the possibility that part of the BIOS could be corrupt hence this approach not working but I think it’s unlikely. From my previous experience working in a computer shop most people brick there machines BIOS when a flash fails. Guess the HAD-befriended buspirate would do the same job, maybe even much more easy. The CPU blades that we develop at work have a USB/serial recovery method that accepts a USB stick with a BIOS.ROM file on it, or if that fails, you have XMODEM serial BIOS recovery. This is assuming the recovery portion of your SPI device isn’t corrupt as well. I can attest that Pete is telling the truth. On my eee 1000h, it’s alt-F2. It finds any usb device that has a 1000h.rom in root and installs it. I’ve also seen motherboards that can boot from a bios file stored on media. I have an old panasonic toughbook cf-27 that I updated the bios in and ever since it won’t charge up the batteries. But I would need to find the old rom first. Perfect for exercising the buspirate. Wow do it the hard way…. “bricked” bios is easy as pie. Get a motherboard or PC that is identical just to use for a couple of minutes. Boot with bios update software. chip puller to yank good bios live… yes live. 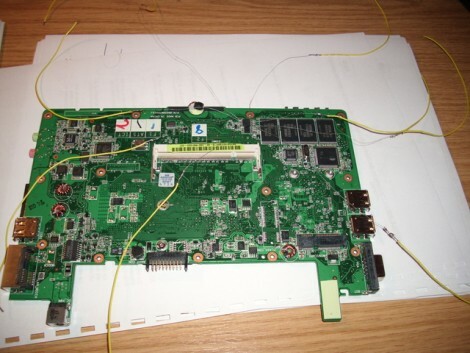 In fact I found that you dont even need the same board, just a compatable one that has the same bios chip. Works great. @ osgeld – i have loads of mobos just lying around. But true, not everybody has a hot air gun for those soldered BIOSes. However if you do it’s a whole lot easier than rigging a micro up. But props for some clever use of an Arduino. All those clocks were kinda getting on my nerves. When the bios is properly fried it won’t address the keyboard and or the usb ports. Either that or it is listening in the wrong place. I know, because I have a 900a that fried itself on a bootable USB with Lucid upgrade. So the bootable USB and Alt F2 doesn’t work. The device is not quite as dead as a parrot – three lights come on – but it is unreachable. I was dreading the unsolder option so I shall try this very soon. Wow overkill much? This can be done with a standard parallel port. Surely any hacker worth his or her salt still has access to one of those? This is pretty awesome. I would liked to have seen some perhaps custom BIOS work :P Such as possibly adding a different logo at the POST. Wow thanks guys for all those reactions ! BTW, the Eee still works, as new !